Have you received an email that looks like the image below? 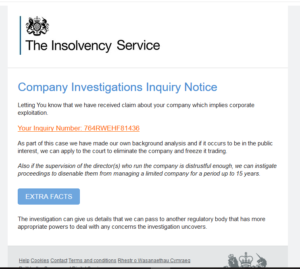 The subject of the email: Company Investigations Inquiry Notice. If you receive an email like this you should delete it. Do not click on any links contained in the message as users are forwarded to a site that downloads malware. Information on protecting yourself from cyber fraud and where to report it is available from Action Fraud, the national fraud and cyber crime reporting centre.